Republic of Gamers or better known simply as ROG was a sub-brand formed by ASUS in 2006 to meet the needs of gamers. Today, more than a decade on, it has grown to be a formidable force and its catalog now spans the entire gamut of gaming devices and peripherals, from fully decked out gaming systems to notebooks, motherboards, graphics cards, keyboards, mice, monitors, and even sound cards. It is an impressive lineup and a testament to how far the ROG brand has come. But in its 11 years, there was never a ROG router, which is curious because online connectivity has become a very important part of gaming. 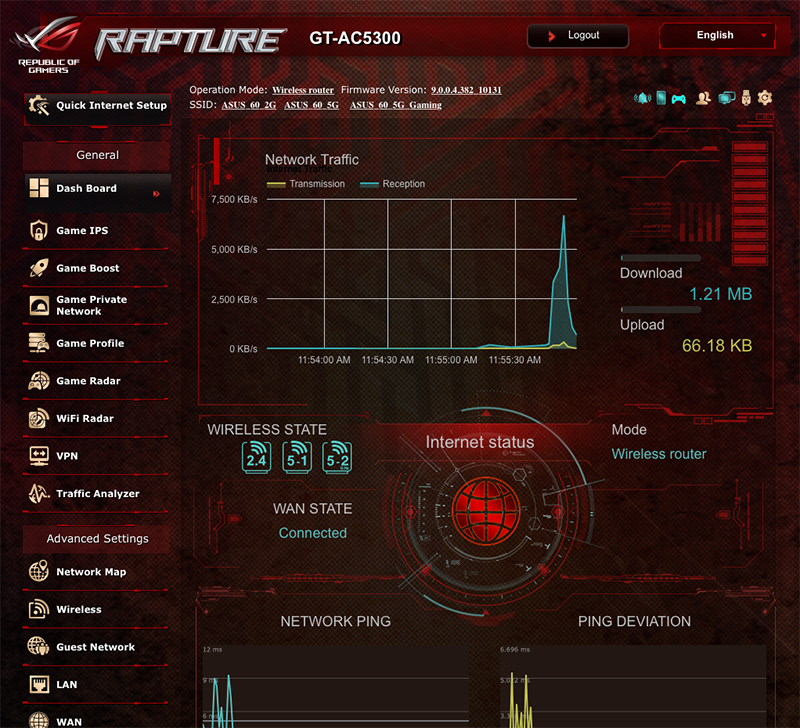 However, that all changes today with the new ROG Rapture GT-AC5300 router. This is the first ROG router and it is an absolute beast. Let us take a look at its key features. 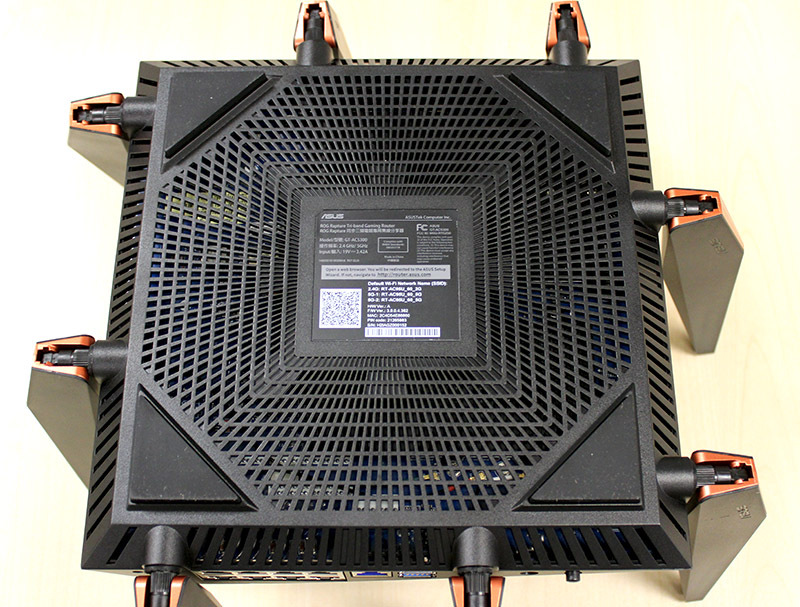 If you are familiar with the older ASUS RT-AC5300 router, then the new ROG Rapture GT-AC5300 router should look familiar to you. The two routers are practically identical on the outside. Both routers have identical dimensions, weight, and have the same boxy look with eight large external antennas. The only way to differentiate them is by the logo on the top panel and by its ports. The RT-AC5300 has an ASUS logo while the ROG Rapture GT-AC5300 has a ROG logo. The ROG Rapture GT-AC5300 also has way more ports, but more on this later. The looks of the ROG Rapture GT-AC5300 is certainly controversial. Many people have described it as a spider and crab, and a good number of people also think its ugly. Personally, I’m quite fond of it. High-end routers should look different and edgy, and this design ticks those boxes for me. However, I will concede that it is really bulky and heavy. Inside, the ROG Rapture GT-AC5300 has upgraded internals. The CPU has been upgraded and it is one of the fastest I have seen in a router. Specifically, the ROG router is running a 64-bit Broadcom BCM49408 processor that is clocked at 1.8GHz. It also has a massive 1GB of RAM, which is also the most that we have seen on any router. 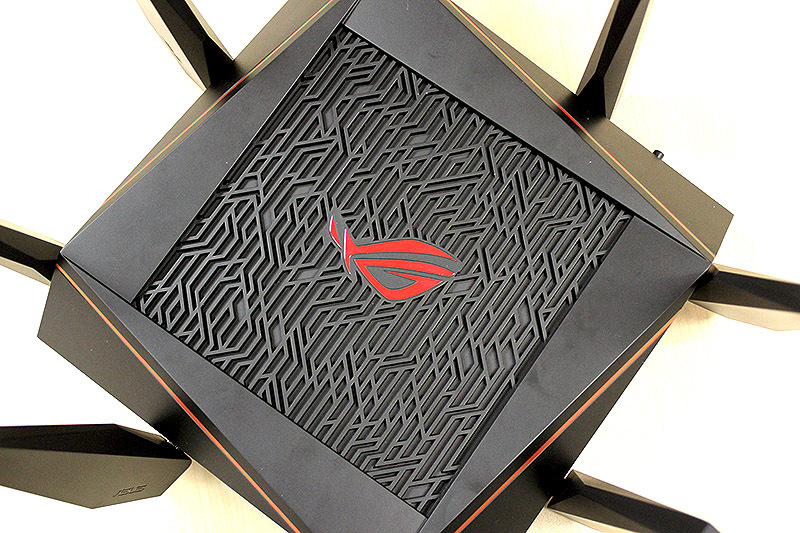 Clearly, the ROG Rapture GT-AC5300 is one powerful router. Alongside the powerful processor, the ROG Rapture GT-AC5300 uses three BCM4366 radios for transmission. This is the same of radios that most AC5300-class routers use. These radios support 4x4 streams and also support MU-MIMO. Rated speeds are as follows: 1000Gbps on the 2.4GHz network and 2167Mbps each on its two 5GHz networks. Add them all up and you get 5334Mbps. The reason the ROG Rapture GT-AC5300 requires such a powerful processor is because of the wealth of features that it packs. Let’s begin with the more obvious ones first - the ports. 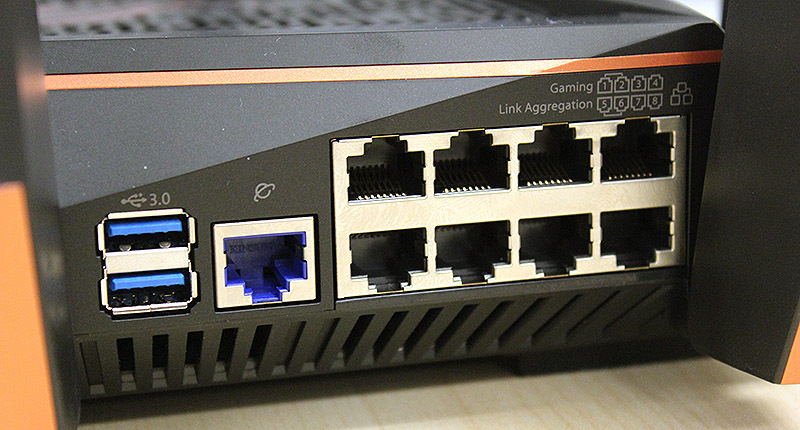 In keeping with today’s increasing connected households, the ROG Rapture GT-AC5300 comes with a single Gigabit Ethernet WAN port and eight Gigabit Ethernet ports. But that’s not all, out of the eight Gigabit Ethernet LAN ports, two are dedicated gaming LAN ports that are optimized and have top priority over all other traffic. Apart from the gaming ports, there are another two LAN ports that support link aggregation, allowing users to combine them to create a single super-fast 2Gbps connection. This is useful especially if you have a high-end NAS system connected to the router. Speaking of connections, the ROG Rapture GT-AC5300 also comes with two USB 3.0 ports. It’s worth noting that most routers, even high-end ones, usually only come with a single USB 3.0 port, the other USB port usually only supports slower USB 2.0 speeds. Faster USB 3.0 ports are preferred especially if you wish to share files over your network using external storage drives. Ports aside, the ROG Rapture GT-AC5300 also has LED status indicators on its front and also buttons to quickly turn off Wi-Fi and the LED status indicators. There's also an additional button for quick WPS setup needs. Beyond the high-speed Wi-Fi networks and extensive LAN and USB connections, the ROG Rapture GT-AC5300 also comes with a new router management interface called ROG Gaming Center. It is, as you can see from the screen-capture above, very red and quite cool. Long-time ASUS users will probably recognize it as being very similar to the ASUSWRT router management interface that is found on their regular non-ROG routers, but look closer and there are some notable differences. 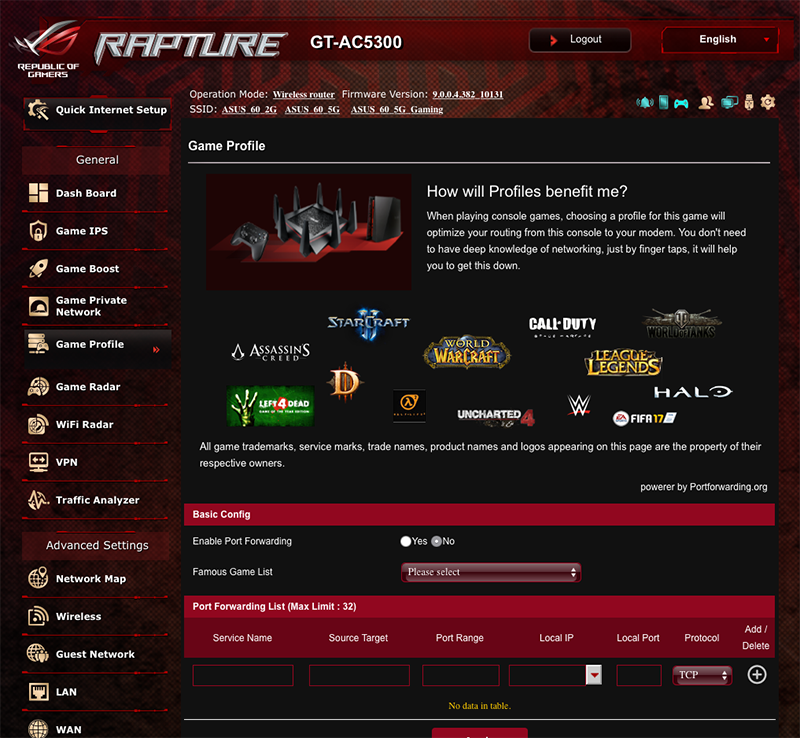 Under the General tab, you can see a couple of Gamer-centric features like Game IPS, Game Private Network and Game Profile. Curiously, some of them are actually a rename of features found on other ASUS routers. For example, Game IPS is really the same AiProtection, and you can find Game Boost and Game Private Network on other ASUS routers too. What is new and useful to gamers, however, are Game Profile and Game Radar. Game Profile automatically sets up Port Forwarding for popular online games like CS:GO, World of Tanks, World of Warcraft, Starcraft II, and Overwatch. Just select the game from a drop-down menu, hit Apply, and you are done. Game Radar, on the other hand, shows you the ping status of game servers of popular online games like Dota 2, Overwatch, World of Warcraft, and more. So if the game you play allows you to pick a server to connect to, you know which one has the lowest latency. 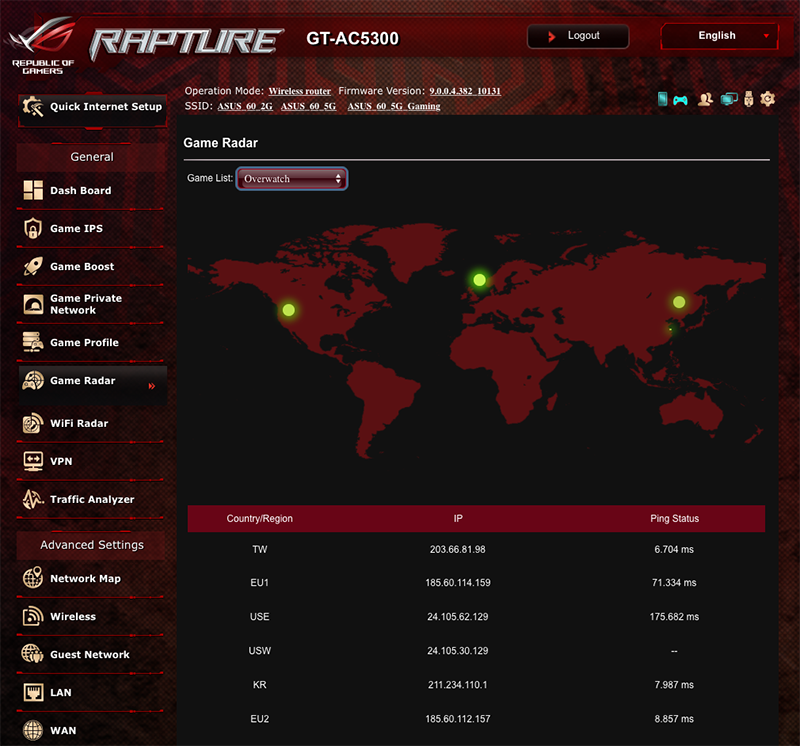 Another new feature that is found on the ROG Rapture GT-AC5300 is WiFi Radar, which is a wireless network scanner tool. Elsewhere, the ROG Gaming Center has the same features and functions found on other ASUS routers such as Game Boost, Traffic Analyzer, Guest Network, Network Map, AiCloud, Parental Controls, Adaptive QoS, and more. In a nutshell, what you are getting with the new ROG Rapture GT-AC5300 router is all the features found on other high-end ASUS routers, plus new ones like Game Profile and Game Radar that will delight gamers. 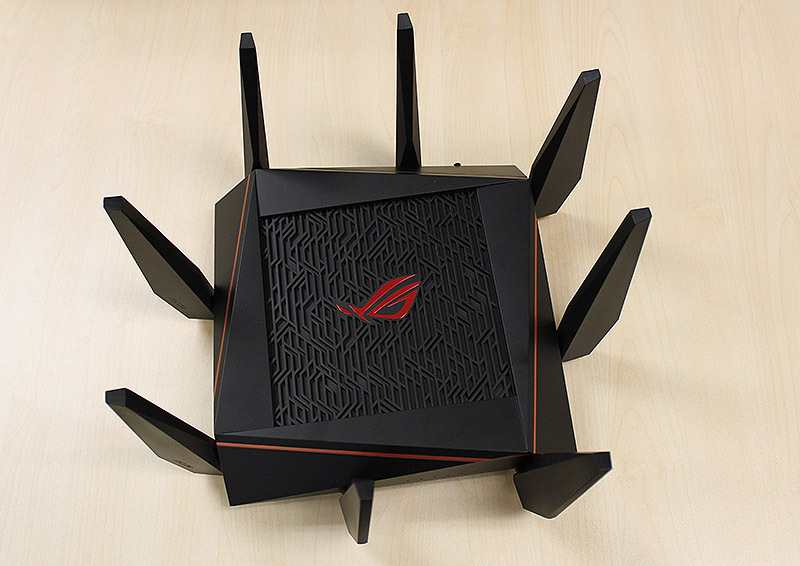 Of course, like any respectable high-end router these days, the ROG Rapture GT-AC5300 router can be remotely managed and controlled using the ASUS’s suite of mobile apps that can be installed on your iOS or Android mobile device. There are four apps in total. 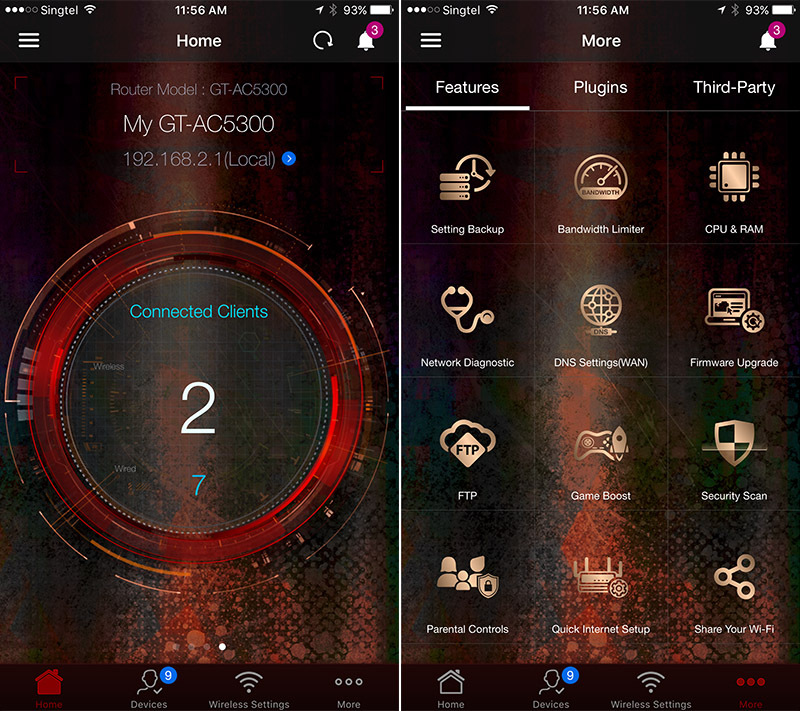 The ASUS Router app lets you monitor router usage and alter QoS settings. The AiCloud app is required if you want to enable cloud storage functionality. The Download Master app lets you schedule files for download using torrent clients. And lastly, Device Discovery traces all your ASUS networking devices, including your router, repeater and IP camera. The apps are easy enough to use, but it’s a cumbersome system and we would rather have had a single app that can do it all.